So much of what exists today is virtual, our senses confined to what we see on a screen, experience only with our fingertips or hear through headphones. I certainly never discount the intelligence and effort that goes into developing an ‘app’ or an electronic piece of hardware. To dismiss the abilities that go into how we interact with our new modern world would be hypocritical of me, as I use technology in both my personal and professional life. Yet I still long for what I consider the truly tangible, those items that exude old world craftsmanship. As has become a fortunate habit in my life an individual I meet leads to another and yet another. Such is the case with this Musing. Years ago while photographing a theatrical performance I wandered down to the orchestra pit to photograph the musicians who are seldom seen during a performance. There was a woman whose pure musical passion was evident as she tuned her instrument; the cello. I snapped a few images of her and through those simple images we became friends. Kris is a remarkable artist and I often fantasize about falling into deep slumber while listening to the sounds of her cello. 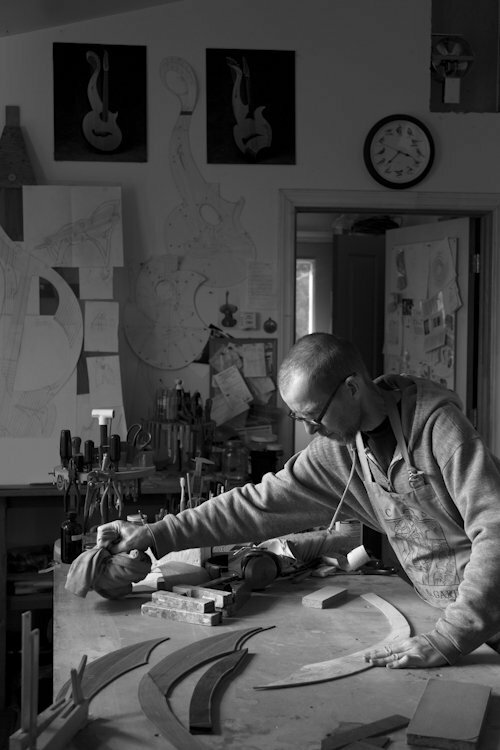 After meeting Fred and his wife Suzy who makes handmade violins I was immediately motivated to ask if we could embark on a joint project, to document in photographs and words one instrument from its conception to birth. Fred conveyed to us that an instrument can take up to 1,000 hours to construct and the project may take up to a year to complete. Each element is hand formed and many of his construction tools are handmade as well. I have a great respect for those who make items with their hands and minds working with materials that are grown from the ground and in this case make sounds that take my mind and imagination to places it has never ventured. I certainly never want craftsmen like Fred to vanish from this life, for they remind us that life is much more than a backlit screen or the swipe of a finger. What he provides all of us is a vital link to the type of craftsmanship we should never forsake.